Kuipers, Aert H. (1974). The Shuswap Language: Grammar, Texts, Dictionary. The Hague: Mouton. https://wine.wul.waseda.ac.jp/search~S12*jpn?/aKuipers/akuipers/1%2C14%2C28%2CB/frameset&FF=akuipers+aert+hendrik&2%2C%2C3. Boas, Franz & Herman Haeberlin (1927). "Sound Shifts in Salishan Dialects." In International Journal of American Linguistics 4. Baltimore. Czaykowska-Higgins, Ewa and M. Dale Kinkade (1998). 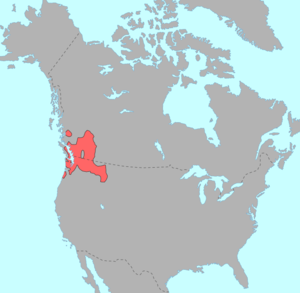 "Salish languages and linguistics." In Ewa Czaykowska-Higgins and M. Dale Kinkade (eds.) Salish Languages and Linguistics: Theoretical and Descriptive Perspectives, pp. 1–68. Berlin / New York: Mouton de Gruyter. Swadesh, Morris (1950). "Salish Internal Relationships." In International Journal of American Linguistics 16. Baltimore. Thompson, Laurence C. (1979). "Salishan and the Northwest." In Lyle Campbell and Marianne Mithun (eds.) The Languages of Native America: Historical and Comparative Assessment. Austin / London: University of Texas Press.